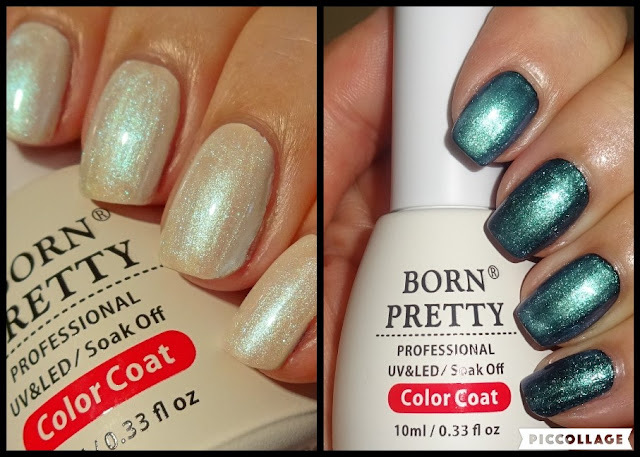 I've got a couple of manis to share with you today using a UV gel nail polish as a topper from Born Pretty Store. The collection is called 'Chameleon Pearl Lustre Mermaid Shell UV Gel Polish' and there are 6 colours to choose from. This is Jade Sky which has a milky white base and green iridescent shimmer, it reminds me of mother of pearl especially over a white base. It transforms a black base to a galactic milky way. There are 6 stunning colours in the range all wonderfully unique. The Pearl Lustre UV Nail Polishes are currently $3.99 / £2.90 / €3.25. You can also use my 10% discount code HXBQ10 which gets you 10% off full priced items. Check out the Born Pretty Store website for loads of cool nail art goodies. Born Pretty Store is also on Twitter, Facebook, Blog, Instagram, Pinterest & Youtube.